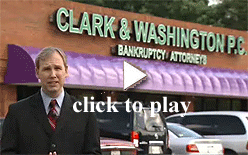 Why Choose Clark & Washington? 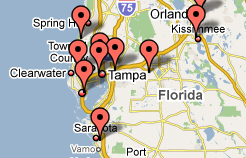 Bankruptcy can be a complicated process, but experienced Tampa bankruptcy law firm Clark & Washington, P.C. make this difficult time as hassle-free as possible for your and your family. We understand what you’re going through, and want to help however we can. In most bankruptcy cases, the chronology of events is generally the same. Our process is finely tuned to insure that you not only have all the information you need before filing, but that you are involved and comfortable every step of the way. No more waiting around to hear from your attorney or spending countless hours trying to get updates on the status of your case. Attend a free consultation. At this FREE, no-obligation consultation you will meet with an attorney to discuss your current financial situation. The experienced individual will counsel you on which chapter (13 or 7) is the best option for you. If the attorney feels it is not the best time for you to file or that you shouldn't file at all, he or she will provide you with additional options. Bankruptcy cases begin with a petition. The petition is a complex document that includes a characterization of your debts. Your Clark & Washington, P.C. attorney will file this petition on your behalf under either Chapter 13 or Chapter 7 based on information you have supplied. Four to six weeks after you file you will attend a meeting of creditors. The Bankruptcy Trustee assigned to your case chairs this meeting. Unless your case is deemed unusual, this meeting is brief. The trustee will ask you a few questions. Sometimes credit card providers attend these meetings. If you've filed under Chapter 13: you and your attorney will have discussed a payment plan and you will receive a Notice of Confirmation of the plan in about six weeks and begin making payments. If you've filed under Chapter 7: you will receive a notice of discharge in about six weeks. It is hard to say how long this entire process can take. It can be as short as three months or as long as several years. This information should not be used in place of an actual attorney consultation.